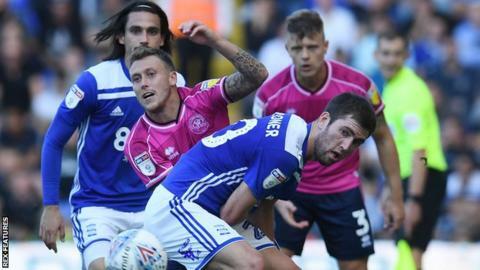 Championship strugglers Birmingham City and Queens Park Rangers played out a disappointing stalemate at St Andrews. Tomer Hemed and Toni Leistner headed over for Rangers in the first half, while Blues' Jota had a penalty appeal turned down and Lukas Jutkiewicz had a shot blocked. Lee Camp made three great saves after the break, twice denying Hemed and once stopping a Luke Freeman effort. Rangers could have won it in the last minute, but Matt Smith hit the post after a goalmouth scramble. The result leaves QPR in the bottom three while Birmingham - who also have four points - move up to 19th on goal difference. Neither side could find a moment of quality to make the breakthrough, although both managers will be pleased that their sides each recorded a second clean sheet of the season. Birmingham remain without a win this season going into the international break and their one shot on target in the whole game will concern boss Garry Monk. "We badly need that first win as we know that in previous games we have done more than enough to have got three points. "Against Rangers it was a scrappy game and there was no real opportunity to get our momentum going. It probably suited the away team. "It wasn't from lack of effort and looking at the six games so far it will not deter us from what we are doing." "First and foremost, it was great to keep another clean sheet. After the West Brom game (a 7-1 defeat), it was something we had to address. "We controlled the game and, on another day, could have won it with the opportunities we had. "Credit to the players, they've worked so hard on the training pitch. It was as good an away performance as I've seen in a while from a team. Joe Lumley didn't really have a save to make." Match ends, Birmingham City 0, Queens Park Rangers 0. Second Half ends, Birmingham City 0, Queens Park Rangers 0. Matt Smith (Queens Park Rangers) hits the right post with a header from very close range. Assisted by Jake Bidwell with a headed pass following a corner. Attempt missed. Massimo Luongo (Queens Park Rangers) header from very close range misses to the left. Assisted by Luke Freeman with a cross following a corner. Corner, Queens Park Rangers. Conceded by Gary Gardner. Substitution, Queens Park Rangers. Geoff Cameron replaces Tomer Hemed. Tomer Hemed (Queens Park Rangers) wins a free kick in the defensive half. Attempt saved. Nahki Wells (Queens Park Rangers) left footed shot from the left side of the box is saved in the centre of the goal. Assisted by Angel Rangel. Corner, Birmingham City. Conceded by Joel Lynch. Corner, Birmingham City. Conceded by Jake Bidwell. Attempt blocked. Michael Morrison (Birmingham City) right footed shot from outside the box is blocked. Assisted by Viv Solomon-Otabor. Substitution, Birmingham City. Viv Solomon-Otabor replaces Che Adams.